Range 190 to 1000 nm with facility for automatic concentration, % Transmission, Absorbance & K Factor measurement. Automatic wavelength calibration and selection. It has sample holder with 4 position selector control for 10 mm path length cuvettes. Facility has been provided for interface with any printer (USB PORT). Set of 2 quartz and 4 glass cuvettes is provided. Highly stable and accurate. Software Included (Imported) stoca kein Test/Kinetic, automatic peak picking & spectrum display. Large screen with graphic display. Spectrum and data can be printed out by printer and sent to computer via USB PORT. Set of 4 quartz and 4 glass cuvettes is provided. 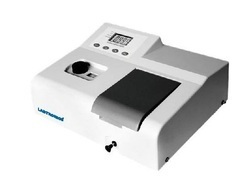 We also supply micro processor Single Beam UV VIS Spectrophotometer beam and they also score on points like versatility, ruggedness, easy operations complete accuracy while determining absorbance, % transmission and concentration of liquid. UV Spectrophotometer offered comprises single beam microprocessor UV/VIS spectrophotometer that is made available in the range from 195 to 1000 nm as well as with facility for % Transmission, Absorbance & K Factor measurement, and automatic concentration. Also coming with 4 position selector control for 10 mm path length cuvettes and sample holder support, it can easily be interfaced with any printer (RST 232C). Further, we offer the system with the support of imported software as well as a set of 2 quartz and 4 glass cuvettes that allows the system to perform smoothly. Single Beam UV Visible Spectrophotometer offered comes with wavelength accuracy of ±0.5 nm, wavelength repeatability of +0.1nm and automatic wavelength setting support. Further, the system also comes with photometric accuracy of ±0.1 %T, photometric repeatability of +0.3 %T and photometric display range of -0.3-3.0A,0-200%T, 0-9999C. For achieving excellent performance, the system has single beam, grating 1200 lines/mm based optical system as well as other functional features like wavelength range of 200-1000nm, band width of 1 nm, stability of +0.002A/h @ 500nm and USB based data output port options. Single Beam Spectrophotometer offered features single beam, grating 1200 lines/mm based optical system and working wavelength range from 190-1000nm. Also coming with band width support of 1 nm, these systems can deliver wavelength accuracy of ±0.5 nm, wavelength repeatability of +0.1nm, provision of automatically setting of wavelength and photometric accuracy of ±0.1 %T. Some of the other features of the system include photometric display range of -0.3-3.0A,0-200%T, 0-9999C, USB based data output port parallel printer port and Deuterium Lamp & Tungsten Halogen Lamp options among others.